The betraying three meet the honest four, Kim Jong Kook bares his abs, and Haha turns Byul reggae. Read on for this week’s Running Man headlines! But we win! Really…I ummm…sorry…um the picture…abs…okay I am back. I promise. Kim Jong Kook appeared on the May 11th episode of Hidden Singer with five individuals who claimed to be able to impersonate his singing voice. KJK pledged to reveal his abs if any one of the five beat him. 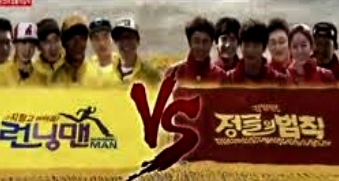 Fortunately one of the impersonators grabbed the win by one vote leading KJK to bear his fabulous abs. I feel happy inside at the commander’s failure to win. Really I do. May 15th marked the celebration of teacher’s day. In honor of hypothetical teachers everywhere 1,312 university students in Korea were asked which celebrities lecture they would not mind standing in line for. Overwhelmingly the students chose the nation’s MC Yoo Jae Suk (with 64.5% of the votes). Placing second in the poll was Kim Tae Hee with 14.6% of the votes.